In this still from a video released by the Kansas City Police Department on Sept. 26, 2016, an officer responds to a call while being videotaped by her partner's body-worn camera. The announcement wasn’t a surprise, since Police Chief Darryl Forte has said in the past that it was likely the force would begin using video cameras. The test will help determine the cost of data storage and any upgrades to the department’s information technology system, he said. Body cameras have grown more popular following a number of race-related shootings by police, dating back to August 2014 in Ferguson, Missouri. Just last week, the Charlotte-Mecklenburg Police Department released footage of the shooting of Keith Lamont Scott, a black man, by police – an event that triggered nights of protests. The department’s cost for the trial period will be about $1,000 for overtime spent on training, as a vendor has loaned KCPD 25 cameras, Forte said. In the area, at least two agencies are using body cameras, in Lenexa and at the University of Kansas. Some of the agencies that have tried using them report a decrease in use of force and fewer complaints from residents. In San Diego, for instance, a 2015 study showed the cameras helped reduce complaints against officers by 44 percent and decreased citizens’ complaints by 23 percent. Peggy Lowe is investigations editor at KCUR and Harvest Public Media. You can find her on Twitter at @peggyllowe. Speaking Monday at an event to raise awareness about child abuse, Kansas City Police Chief Darryl Forté brought a prop to prove his point. That’s a problem, Forté says. When abuse is normalized, kids who were abused grow up to be abusers. 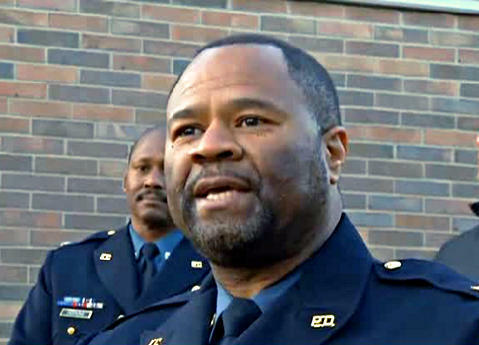 Kansas City Police Chief Darryl Forté is starting the year with his hands full, after another streak of violent crime. So far, the city has seen eight homicides in the first ten days of January. This, following a particularly deadly end of 2015.